We undertake the niche service of renovation or replacement of furniture in court rooms, council chambers and committee rooms which tend to be traditional and ornate. We manufacture bespoke seating in-house at our Reading workshops and so provide a made to measure service often required by these unique, characterful venues. We provide reupholstery services to customers throughout London and the home counties such as Berkshire, Oxfordshire & Surrey. 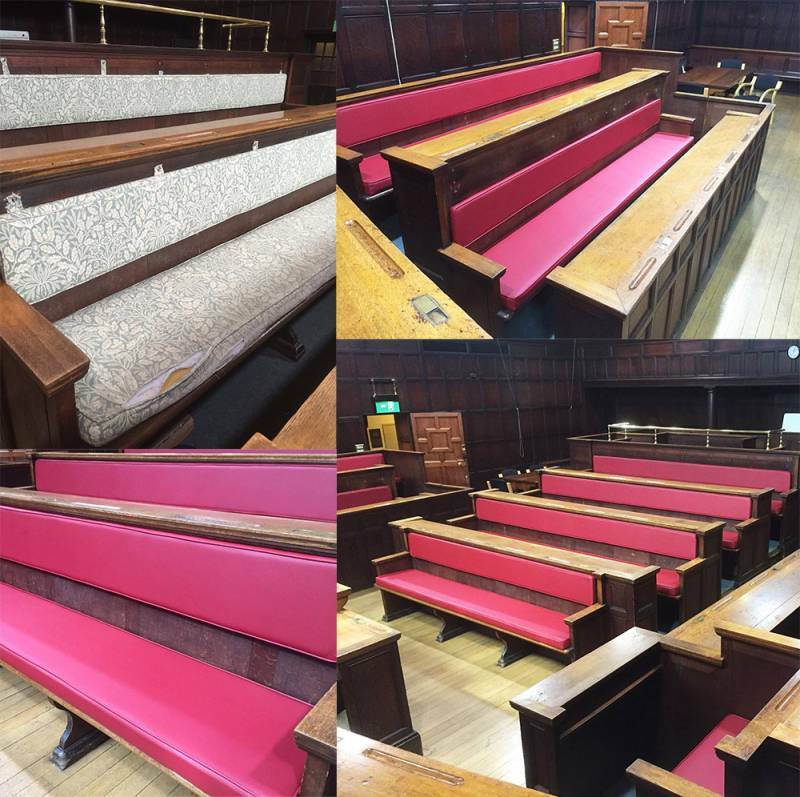 In the photos shown below we created new bench seating for the ‘old court room’ within a large town council building. Tired foam was replaced and mounted on new backing boards, we upholstered the seats & back rests using Camira Mavel – Robin which is a faux leather which really does look and feel like leather, the fabric is available in a range of elegant shades. To avoid damage to the traditional wooden benches we created new velcro attachments which also improve the appearance of the seating. You may recognise the ‘old court room’ from the court scene in A Fish Called Wanda or its appearances on Morse!